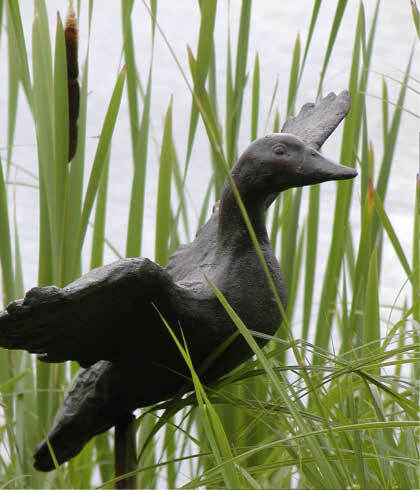 This life size sculpture of a Mallard Duck is shown in our Faux Bronze colour. 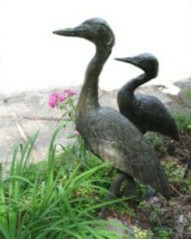 All the Garden Art Sculptures are hand pressed in air-intrained concrete using high grade cut sand and Portland No1 cement. This insures that the pieces can withstand the HARSHEST winter conditions. We recommend a coat of acrylic bonding agent (asvailable from most hardware store) be applied each spring. This will protect the surface colours as it is the agent used to apply the matallic oxides used in the formulation of the pigment layer. The Malard sells for. 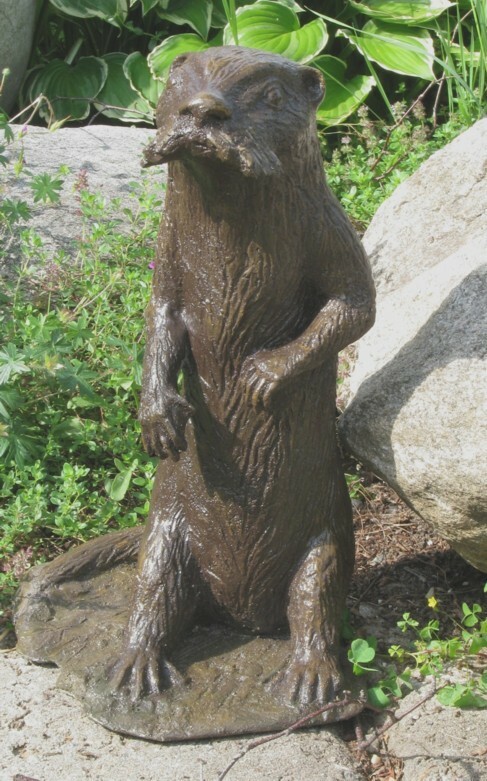 $160.00 and comes with an eight foot patinad copper pipe which will secure it firmly into your garden foliage. 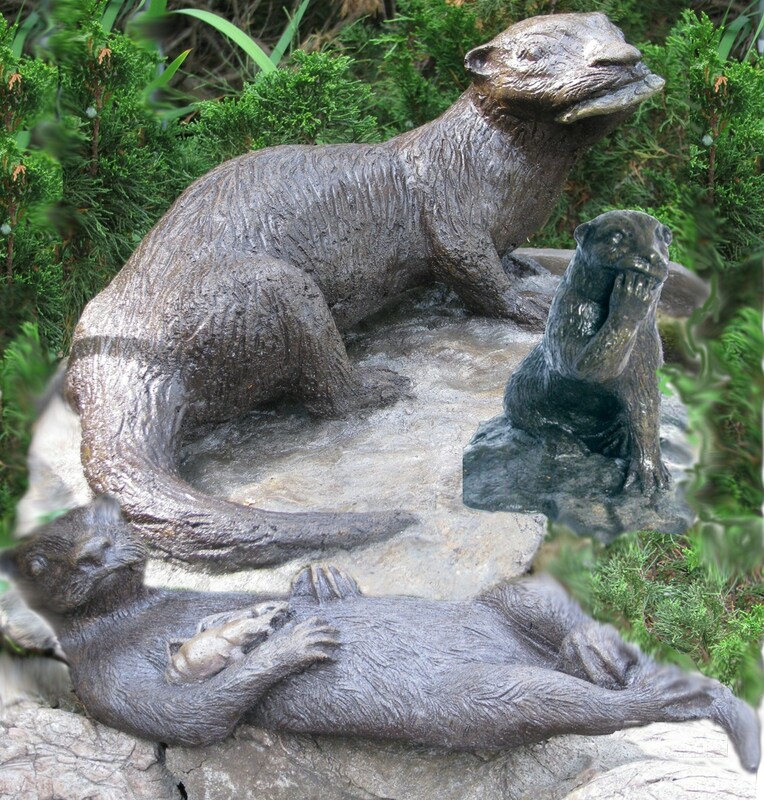 There are four Otters in the series and the three here are: Otter With A Fish in his mouth $180.00, a Young Otter Paw in Mouth $80.00, and Otter on His Back preparing to eat his favourite meal, a crayfish $160. 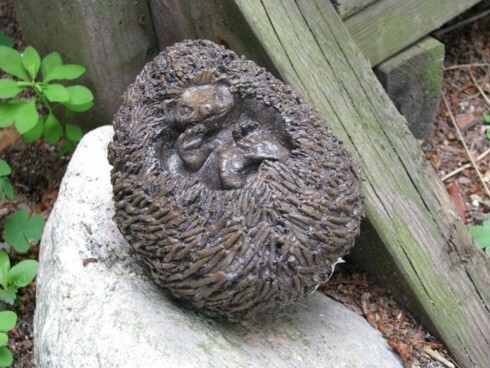 Our sculptor Jane Agnew creates all the originals in clay which allows for exceptional detail in each piece. The clay original is cast in silicone rubber so that it can have a plastic cement mix hand pressed into the rubber mold. The pieces are then hand coated with in-house prepared pigments giving each a unique surface quality. Two coats of acrylic sealant are applied before the piece is finished.We recommend reapplication of an acrylic sealant each spring. This will maintain the colour and surface integrity of the piece. This Hedge Hog is small and fits nicely in your hand. You will smile when you see it in your garden; I guarantee it! $25.